Mr. Semere Russom, Minister of Education conducted seminar for the 31st round members of the national service focusing on the vision, principle and objective of education system in Eritrea. At the seminar that was held on 28 and 29 October, Minister Semere said that education in Eritrea is not only the basic of human rights but also the cornerstone for the national development drives. 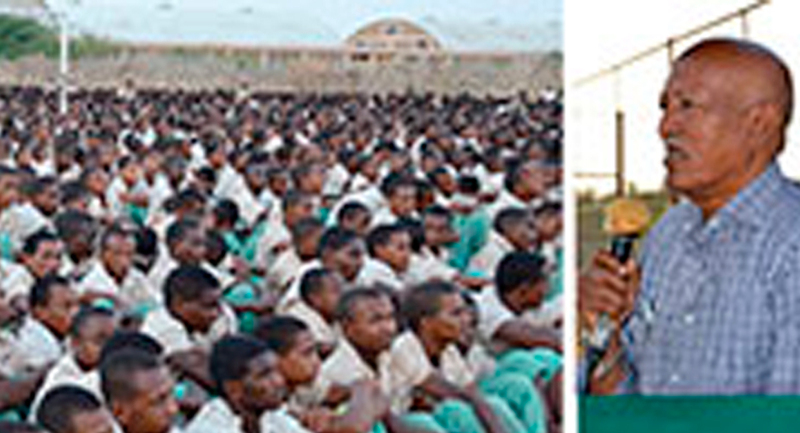 Mr. Semere reiterated that the vision of education in Eritrea is to nurture capable and competent citizens. Pointing out that there were 538 schools ranging from pre-schools to highs schools as well as technical and vocational schools before independence, Minister Russom indicated that currently there are 1938 schools and that has registered 360% increment. Minister Semere went on to say that significant efforts are being exerted to equip the vocational and technical centers with modern machineries and other facilities. Further more, Minister Semere explained that construction of schools, strengthening education in mother tongue, development of curriculum, publishing and distributing of text books, human resources development, advancing administrative capacity, development of libraries as well as capacity development of stakeholders are the priority tasks of the Ministry of Education.